Kieran Sadlier celebrates scoring against his former club. Doncaster Rovers had the Ex-Factor in the battle of the former managers. And, with their season at a crucial juncture, there are very few signs of them suffering from stage fright. In what could prove to be a defining week, a come-from-behind victory over Darren Ferguson’s Peterborough United in a tetchy, incident-packed encounter could be a defining moment in what is turning out to be a fascinating, frenetic and incredibly fun campaign. Rovers teams in the recent past might have frozen or panicked after falling behind very early on to George Cooper’s curler. They might have ran out of ideas or ended up getting done on the counter while chasing the game. But Doncaster under Grant McCann – sacked by Posh a year ago – are a different animal. They had a helping hand when Tyler Denton was sent off for two bookable offences just before half time. And they needed an excellent save from Marko Marosi to prevent Ivan Toney doubling United’s lead following the restart. But there was nothing lucky or fortuitous about the way this relentless Rovers side powered on, stuck to their game plan and steamrollered their play-off rivals with three second half goals in the space of 12 minutes. Ben White turned Danny Andrew’s inswinging corner into his own net before John Marquis lashed home his 21st goal of the season from close range after Mallik Wilks had hit the post. Wilks hogged the limelight. He was at fault for Posh’s goal and risked seeing red himself after a coming together with Toney. He was also Doncaster’s most dangerous attacking player before being subbed in the closing stages, unnecessarily goading Ferguson on his way off. By then Ferguson’s frustration was etched all over his face, particularly after Kieran Sadlier’s controversial third goal. With Joe Ward down and requiring treatment, but off the pitch, Posh goalkeeper Conor O’Malley rolled the ball out of play. From the resultant throw Herbie Kane opted not to give the ball back to the visitors and instead released Sadlier who unleashed a superb strike into the far corner. ‘We’ve got McCann, super Grant McCann’, sung the South Stand. Unsurprisingly, with tensions running high, Fergie got a few pelters too. Rovers, in the process, leapfrogged Posh into sixth place. They could really firm up their top six status by winning one of their games in hand at home to Southend United on Tuesday. Doncaster’s FA Cup exploits might have captured the imagination of supporters since the turn of the year and there is the small matter of a fifth round tie with Crystal Palace to look forward to next Sunday. But four points out of six from games against Portsmouth and Peterborough suggests that Rovers remain completely focused on the main prize of promotion. It was slightly surreal seeing Ferguson in the opposition dugout, his team rocking a very familiar midfield diamond. And it made for an intriguing comparison with the way McCann has set his team up since replacing the Scot over the summer. But the fact that Posh were reduced to 10 men for half of this contest rather quashed the validity of those comparisons. Doncaster have certainly benefited from the greater width afforded by McCann’s 4-3-3 and Wilks’ powerful running down the right proved to be a key outlet during this game. Posh looked to stifle Rovers in midfield and had a certain amount of joy, notably keeping Ali Crawford and James Coppinger quiet. But the home side were the better team and made their numerical advantage count in the end. It was slightly ironic to see full backs Danny Andrew, Aaron Lewis and then Matty Blair bombing on effectively in the way that it did not always happen for Ferguson – in what became a somewhat problem, injury-affected position. The big change at Rovers,this season, however, appears to be in their mindset. Peterborough seized the initiative on the scoresheet early on and their approach immediately seemed to turn to protecting what they had. Denton’s first booking was for time wasting with an hour still to play. With age, Ferguson has seemingly become more and more cautious, ditching the gung-ho tendencies of his early years in management. But it’s that kind of fearless positivity which appears to have rubbed off on McCann, who played under Ferguson at Peterborough before stepping into the dugout. 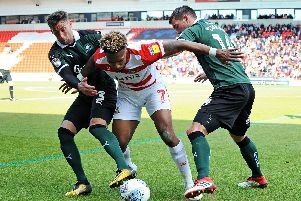 When Doncaster score now it’s about scoring again, and again, and again – not simply trying to hold onto what they have, defending deeper and deeper. The Rovers players have completely bought into that approach and it was evident in their hunger for more goals after going 3-1 up. Marquis and Tyler Smith might have added to Ferguson’s misery but they were denied by O’Malley. Rovers have scored goals for fun under McCann. They’ve already scored more league goals than they did in the entirety of last season and the belief they have gained from that was very evident in the way they got one over their former boss. Over the next five weeks Rovers have three Tuesday night games and a bonus FA Cup tie against Premier League opposition. With the final straight in sight, it’s not just a busy time but a key part of the campaign. And McCann appears to be utilising his squad superbly well. Who would have thought that captain Andy Butler would not come straight back into the side after his recent suspension? Or that Tommy Rowe would have to be content with being a bit part player upon his return to fitness? Ben Whiteman, Herbie Kane and John Marquis are mainstays but the effective rotation elsewhere in midfield and attack is testament to the mentality McCann has embedded into his players and should stand Rovers in good stead for the run-in. McCann is spoilt for choice in attack and, when called upon, the likes of Sadlier and Smith are making an impact. The depth of the squad was a cause for concern at the start of the season but not any more.